Firing the “parts cannon” at an active ABS wheel speed sensor code often results in misdiagnosis and an unhappy customer. It may start with the wheel bearing hub unit or wheel speed sensor. If those parts do not resolve the problem, the technician may fire the parts cannon at the ABS hydraulic control module. Typically, the customer’s patience and wallet runs out before the car is fixed. From the heat-treated wheel bearing races to the microcircuit inside the ABS module that processes the signal, you need to understand the mechanical and electrical operation of this foundation technology that is critical to ABS, stability control and ADAS. Wheel speed sensor codes come in two flavors — “electrical circuit” codes and “erratic” codes caused by conditions where the ABS module can’t rationalize the outputs of a given wheel speed sensor. Circuit codes for opens and shorts are easy to understand electrically. Codes for erratic performance can be caused by the physical relationship between the wheel bearing encoder ring and the wheel speed sensor. These codes are generated when the module processing the signal can’t rationalize the changes in speed when compared to the other wheels, or to the laws of physics. All wheel speed sensor codes are just the starting points of a diagnosis, and not a reason to order a part. As stated earlier, erratic wheel speed sensor codes are set because the module can’t rationalize the output of a sensor. 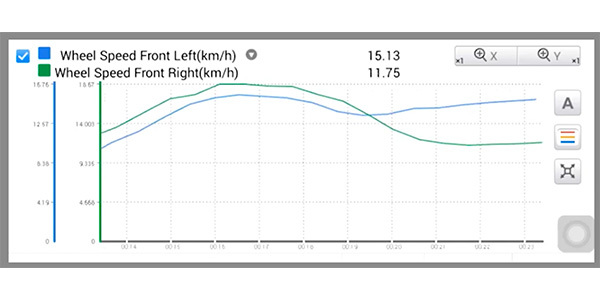 If the module sees a dropout of the signal from the sensor, it would literally translate into the vehicle stopping in inches and then accelerating back to that speed in a few inches. The software controlling the ABS knows this is not possible, so it sets a code. If you are looking for a new scan tool, wireless connectivity with the OBD II port can make wheel speed testing easier if you are working alone. 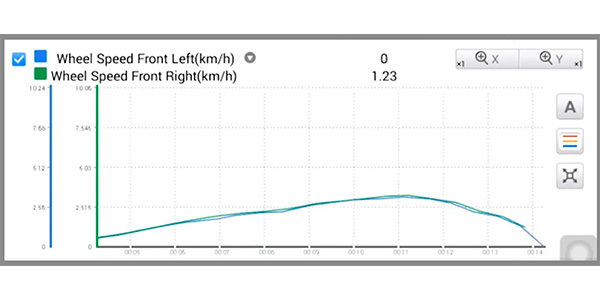 With a vehicle on a lift, you can observe wheel speed sensor data as you spin a wheel. Also, you can inspect a harness to see if poking or pulling changes the continuity of a circuit. It is very difficult to repair WSS harnesses since the harness is in an environment that is exposed to water, heat and flying debris. The voltages measured by the next generation of wheel-speed sensors are so small that an alteration in the wiring can cause problems. This can lead to even more ABS diagnostic codes being set. Replace the harness because no amount of heat-shrink tubing or solder will work as well. 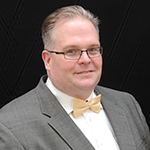 If you find a single WSS that is reading slower than the others, the cause may be one of two things: an oversized tire on that wheel or the sensor is not generating a pulse for every notch in the tone ring causing a lower than normal speed output. Things to check for here (besides the tire size) would be rusty, corroded or damaged teeth on the tone ring, or an excessive air gap between the tip of the sensor and the ring. Something else to watch out for is mismatched parts. To produce an accurate signal, the sensor’s tone ring must have the correct number of teeth for the application. Make sure the tone ring on a replacement rotor, drum, axle shaft or wheel bearing is the same as the original. 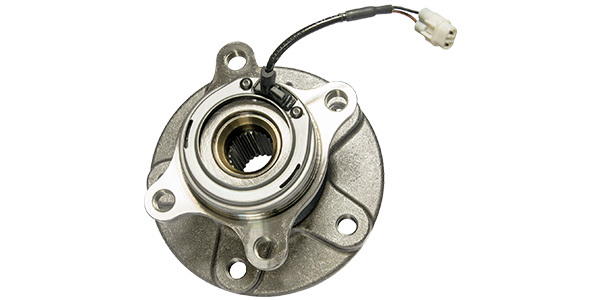 Often, the part will fit, but the OE changed the specification from the previous year or even changes in trim level will change the encoder ring. A low current amp clamp can be used to check active wheel speed circuits. 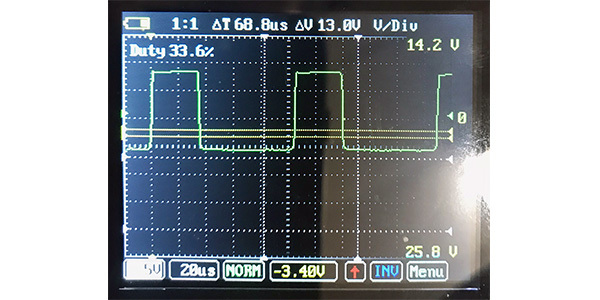 It will not be able to see with the same resolution as a voltage test, but it can confirm if the module is providing power and even a bias voltage signal. The only problem is finding a section of the harness where the two wires are divided in the wheel well. On a typical passenger vehicle weighing around 3,400 pounds, each pair of front-wheel bearings, as well as the rear-wheel or axle bearings, support around 850 pounds, depending on the weight balance and driveline configuration. If it’s a 6,000-pound SUV, each bearing might carry about 1,500 pounds. This load is concentrated on the relatively small bearing surfaces. To understand why active wheel speed sensors fail to report the correct speed of a wheel, it is necessary to understand what happens inside the bearing and the rolling elements, and how they change the relationship of the encoder ring and the sensor. On a typical passenger vehicle weighing around 3,400 pounds, each pair of front-wheel bearings, as well as the rear-wheel or axle bearings, support around 850 pounds, depending on the weight balance and driveline configuration. If it’s a 6,000-pound SUV, each bearing might carry about 1,500 pounds. This load is concentrated on the relatively small bearing surfaces. 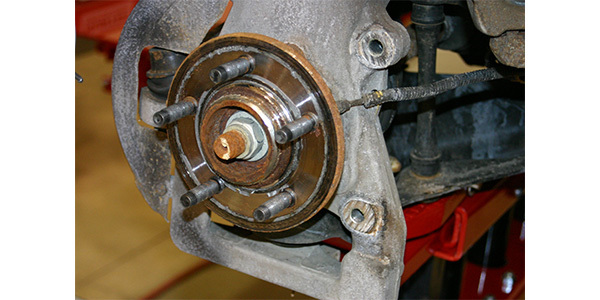 Wheel bearing failures are event-related. Curb strikes, potholes and other incidents that may cause damage to the bearing surfaces and seals are what kill bearings, rather than an abundance of miles. Back in the day, experiencing some play when tugging at 12 o’clock and 6 o’clock was normal. On most modern vehicles, it would take the world’s strongest man to feel any play. Nowadays, bearing play is best measured by placing a dial indicator against the hub and turning the wheel. Refer to the vehicle manufacturers’ specifications, but as a rule, no more than 0.005” of play is allowed for most sealed wheel bearing and hub assemblies. This is due to the air gap tolerences between the encoder ring and sensor. Most bearing components are heat-treated to harden the metal. But, the heat-treating can penetrate only so far into the metal. 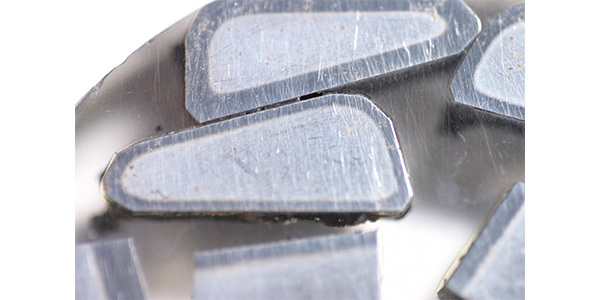 Once the bearing has worn through the treated layer, rapid and catastrophic wear occurs to the softer metal below. This type of fatigue failure is called “spalling.” The damage causes the metal to come off in flakes. The material loss of the races and rolling element creates play and noise. When the bearing play is great enough, the seal attached to the inner race becomes dislodged from the groove in the outer race. The movement damages the seal and the encoder ring that is embedded in the seal.